Every year as many as 7 lakh students appear for the Intermediate Examination from thousands of Junior colleges. There are different streams or commonly called as groups in the Intermediate course like M.P.C, Bi.P.C, M.E.C, C.E.C, H.E.C etc. Based upon their interest the students can choose any stream. Exams for all the streams will commence from the same date though the examination paper will different based upon the stream chosen. BIEAP has released the official Time table for both 1st year & 2nd Year Intermediate students on December, 2018. The exams will commence from 28th of February, 2018 and last till 17th March, 2018. Just 1 month ahead of the exams the students are eagerly waiting for the Board of Intermediate, AP to release the exam Hall tickets to know their examination Center. The students can also take their Hall tickets from their respective colleges. AP Intermediate 2nd Year Students will also have Practical Examinations before the main Board Exams which will commence from 1st February, 2019 and will last till 21st February, 2019. The Hall ticket for both Practical & descriptive exams will be different. Hall Ticket for Practical Examinations will be provided in the college itself where as for the main Intermediate descriptive examinations the Hall Tickets will be provided for download from the official Board of Intermediate website - bieap.gov.in. This time the practical exams also have jumbling system. Previously the practical exams for students were conducted in their respective colleges itself, but now the system is changed. The students will have different Exam centers for Practical Exams also. As it is new to the students they need to be fully prepared with all the experiments. How to Download AP Intermediate Hall Tickets? 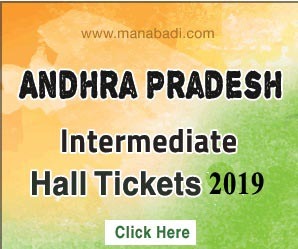 AP Intermediate 2019 Hall Tickets can be downloaded from the official site bieap.gov.in or in www.manabadi.co.in. 1st year students click on AP Intermediate 1st Hall tickets download & 2nd Year students click on AP Intermediate 2nd Hall tickets download. 1 - Roll No. : Roll no. is the Hall ticket Number which will be unique for every student. 2 - Name : It is the candidate's name. 3,4 - Father's Name & Mother's Name : The names of the Parents of the student appearing for the exam will also be mentioned in the Hall ticket. 5 - Center Name & Address : - This is the most important field. The student need to clearly check where to go & write the exam. 6 - Medium : It is the medium of study of the candidate based on which their examination Paper will depend. 7 - District : District where the student belongs to. All the above personal details of the student mentioned in the Hall Ticket along with the student's Photo (with signature) will be provided to the Board of Intermediate by the college where the student belong's to. The student is asked to fill in the application form in the college itself, so he/she must be very carefull while filling up the form. It should always be done under the guidance of the candidates' Parents. On the day of the exam be there in the center atleast before 1 hour to ensure that you will be on time to attend the exam. How Important is AP Intermediate Hall Ticket? First & foremost importance of the Hall ticket is - a student cannot attend the exam without this. For Intermediate 2nd year students, while applying for extrance exams the Intermedite Hall ticket number is mandatory. During the conselling sessions of the entrance exams attended, the students need to submit the Intermediate Hall ticket along with all other certificates. AP Intermediate Hall ticket is very importan for the students even for future references while seeking admission in various courses after Intermediate. Hall tickets of 2nd year. Sir /madam garu please tell me the exam centers and please!! Sir plz can u post the release date of intermediate 2ndyear hall tickets.. When will the 1st year hall tickets releases...? i lost my hall ticket.. how to download it? Dear Students,The Andhra Pradesh Board of Intermediate Education scheduled to the AP Intermediate Results on 13th April 2018 .
generate my mobile nos.in ts intermediate board. Sir, Next year on wards please change the hall ticket download system. My request is please send OTP to concern person mobile number. after typing OTP then only they are able to download HALL TICKET. other wise who knows my mobile number or my daughter's hall SSC hall ticket number may download my daughter's hall ticket. they know the exam centre details. This is helpful from the problem of eve teasing or other. this is completely violation of privacy of the candidate. especially for female candidates. Please look into the matter. other than that your system is excellent. Dear Students,AP INTER 2018 Halltickets Available Now . The hall tickets will not appear in online. Because so many students are not paying examination fees to inter college. So the hall tickets are issued by only colleges. thank you. When will you issue 1st year intermediate hall tickets??? Hall tickets for Inter 1st released? when will he halltickets be released getting irritated due to this waiting ,make it fast!!!!!!!!!!!!! What is the releasing date of ts inter 2nd year hall tickets? ?when are you going to release in online?? when will the halltickets...available on internet....sir/mam..? Please show fast the inter hall tickets so gThat we can download it . Sir,I am studying intermediate 1 year and I want to know my exam hall centre please inform me, I request you sir. Please siniour inter hall tickets . when will be releasing intermediate 1st year hall tickets? TS 2nd year hall tickets release date ??? When the TS intermediate Hall tickets going to be release..? Hallticket no:-1860115355 where is my centre sir. Hall tickets are not available. Please upload hall tickets fastly. I want to know my center. My hall ticket number 18035139142.wher is my college center. Tel me now. I WANT U KNOW MY PRACTICAL EXAMINATION CENTER. I WANT U KNOW MY PRACTICAL EXAMINATION CENTRE.